The Relax Inn & Suites in beautiful El Cajon Welcomes You! Located just off of the eight Freeway south of San Diego, our central location, friendly staff, expansive well-appointed rooms, affordable rates, and proximity to world-famous attractions makes us the perfect destination while you travel for business or pleasure. Each comfortable guestroom is ADA Defined service-animal friendly. Allow our many on-site amenities help you feel refreshed during your stay. Revel in our perfect California weather while you stretch out and relax by our swimming pool and grab a bite to eat at the restaurant next door. Our great location makes it easy to explore El Cajon's local attractions and nearby San Diego. Personal service and attention to detail are the hallmarks of our friendly staff, and we look forward to having you as our guest. These are general hotel policies. Policies may vary per room type, please check the accompanying room details. The Relax Inn & Suites which sits just off the eight Freeway south of San Diego offers a perfect combination of affordability, location, and comfort. 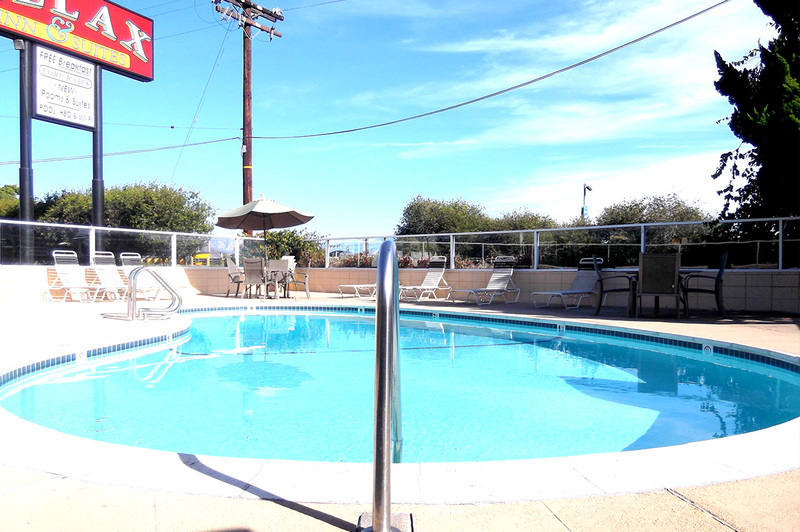 The Relax Inn is the ideal destination for travelers who are looking for a stylish and economical boutique style lodging choice in proximity to the attractions that bring travelers to Southern California year after year. Personal service and attention to detail are the hallmarks of our friendly staff and we are dedicated to making your stay at our hotel comfortable and especially memorable. Relax Inn & Suites is proud to offer a variety of services and amenities to make you stay with us more comfortable. Our guests enjoy pillow-top mattresses, free WiFi, 27-inch TVs with premium cable, HBO and ESPN, in-room refrigerator and microwave, in-room coffee maker, iron, and ironing board, hairdryer, in-room safe, private bathrooms with a tub and shower. Our guests also enjoy our swimming pool, restaurant next door, incoming Fax service and free parking. Our friendly staff is always happy to provide information about our Extended Stay Rates. Our staff is also at your service with information about nearby casinos, world-famous theme parks, and seemingly endless local attractions to make your stay more enjoyable. Guests of Relax Inn & Suites are welcome to take advantage of free parking. WiFi is free for guests of Relax Inn & Suites. Children ages 12 and older are charged as an adult. Extra beds are an additional fee. ADA Defined Service Animals are welcome at our hotel. Well-behaved pets are also welcome at Relax Inn & Suites, El Cajon.